Nearly half of children with cerebral palsy are not receiving the care they need, according to a new study from academics at the University of California, San Diego. While their research has not yet been published in a medical journal, orthopedic surgeons led by Dr. Hank Chambers say up to 42% of kids with a cerebral palsy disorder have not received any of the most common therapies used to manage spastic-type symptoms. Spasticity refers to the involuntary muscular contractions that affect around 7 in 10 children diagnosed with a CP disorder. Remember, the researchers aren’t saying that 42% of diagnosed children currently don’t receive all 10 of these therapies. Over four in 10 children aren’t receiving any of these therapies. And these children, who formed the study’s patient population, are all insured through state-level Medicaid programs. 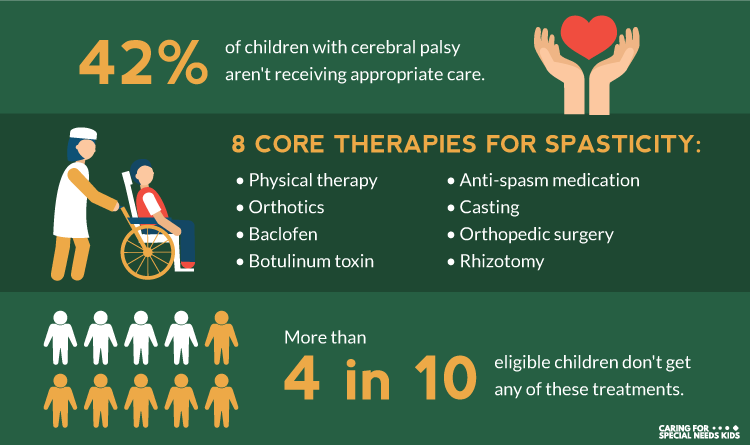 As we’ve mentioned in our dedicated guide to the costs of treating cerebral palsy, the most recent comprehensive data on the topic suggests that lifetime care for a child with a cerebral palsy disorder amounts to around $1.2 million in 2016 dollars. But because the team of scholars and doctors used data from Medicaid to obtain their results, the study also produced several insights into the cost of caring for a child with cerebral palsy. “Insights” may be a stretch, though, because most of their common findings are really just common sense. Turns out children with cerebral palsy require more, and more expensive, medical treatment than other kids. And, moreover, caring for non-ambulatory patients is far more costly than treating ambulatory children. As we said, it’s common sense. To perform their analysis, the research group took data from 15 state Medicaid programs, then identified 3,294 young enrollees (between the ages of 2 and 20) who had been diagnosed with a cerebral palsy disorder out of 7 million total patients. The annual healthcare cost for a kid with cerebral palsy was more than 16 times higher than for a child without the disorder. On average, $22,383 was spent on a child with cerebral palsy per year. Only $1,358 was spent on kids without cerebral palsy. Those medical costs, the authors write, includes everything from hospitalization and outpatient office visits to home nursing care, prescription drugs and orthotic medical devices. Estimating how a child’s functional independence could impact health care costs was a little more difficult. Because the team couldn’t just go out and evaluate each child, they had to figure out which patients were likely to be ambulatory and which were not based on the medical coding used in Medicaid claims. In the end, they estimated that around 30% of the children were probably ambulatory. Another 34% appeared to be non-ambulatory, while no determination could be made in 36% of cases. Looking closer at claims data, the research group found that patients deemed non-ambulatory received nearly $44,000 in medical care every year. The care for children who were considered ambulatory cost an annual $10,400, almost exactly four times less than the non-ambulatory patients. It then became clear that non-ambulatory cerebral palsy patients were boosting the aggregate data. In other words, Medicaid spent 32 times the amount of money treating children who were considered non-ambulatory than it did for children without a cerebral palsy disorder. A little under 8 times the juvenile patient average was spent to treat ambulatory kids. Where Is Cerebral Palsy Care Most Expensive? Of course, we’re still talking about averages here. But as the researchers quickly noticed, health care costs for children with cerebral palsy vary dramatically by location, even for children who are very similar in their functional capacities. The study is, “Costs for the pediatric cerebral palsy population enrolled in managed Medicaid in the United States.” It was presented on September 13, 2017 at the American Academy of Cerebral Palsy and Developmental Medicine Annual Meeting.